SEDONA AZ Bed and Breakfast Finds. Your Sedona AZ Vacation, YOUR Way. 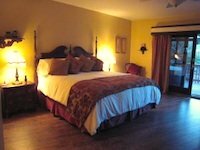 Sedona AZ Bed and Breakfast Reviews: Locals and visitors offer tips for finding the best Sedona Hotels. Been There. LOVED That. Hope YOU Will Too. Click Here To Go To The Main Sedona Lodging Overview. Sam and Irith love owning and operating Boots and Saddles so much, they've doubled their offerings with their new sister property, Sedona Views B&B. Here you'll find the same personalized attentions and thoughtful details for which their first B&B is well known, but with even better views. This huge house is nestled into a tall Red Rock Sedona wall, with undisturbed panoramic vistas and the lush green of (directly adjacent) Coconino National Forest. The owners are very hands-on when it comes to design and food. Irith's interiors are wonderfully thoughtful and comfortable and Sam's chef-ing is creative and fresh. In more ways than one. He makes sure every breakfast is offers a new kind of taste adventure. Like at Boots and Saddles, every one of these 6 rooms has a fireplace and a large jetted tub for two. Plus a flat screen television and fine luxurious bed linens. 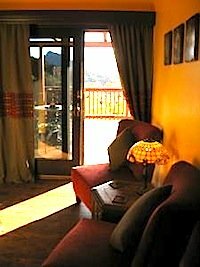 Adobe Grand Villas ($$$$+) is still our favorite B&B for artistic functional-art designs, but we think Sam and Irith deliver the warmest homestyle Sedona Bed and Breakfast experience. This, plus the phenomenal views, make Sedona Views our top pick of all Sedona B&B's. Top 10 Bed and Breakfast In America! And so did Boots & Saddles, by the way. Cheers! Well done!! Rates per night, per couple are just under $300, with $25/day discounts available for stays of 3 days or more. Book A Room Online? Click Here. On The Main Sedona Hotels Page? Click Here. We hope you'll accept a big ATTITUDE of GRATITUDE for your interest in this guide and in our beloved hometown. YOU are the reason SedonaHappy.com exists. << Return to list of top picks on the Main Sedona Bed and Breakfast page. >> Go to to the Sedona-Happy HOME page from this Sedona AZ Bed and Breakfast feature page.